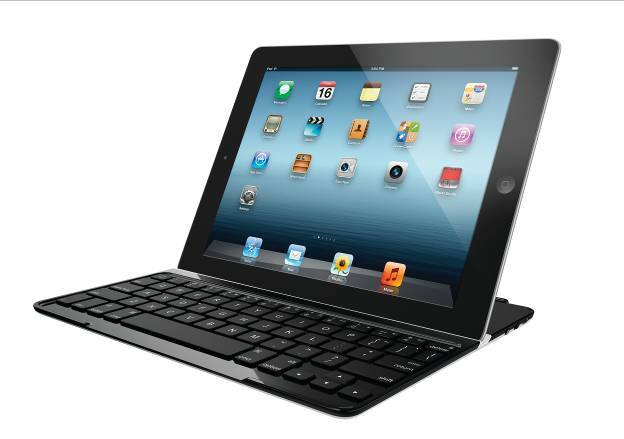 A flip-out keyboard masquerading as a simple iPad cover, the Logitech Ultrathin Keyboard Cover makes a play for anyone travelling with Apple’s tablet. Designed for the for iPad 2, 3 and 4 – and with a new version out for the iPad Air – this Bluetooth keyboard clips to the front of its host as with any regular instant on/off magnetic cover, de-attaching to reveal a fully fledged keyboard. Above the main panel is a canal for slotting – and locking, again with a magnet – the iPad at an angle for some surprisingly comfortable and accurate typing. The Ultrathin – which is about 8mm slim and stretches to 241x181mm up and down – adds 358g to the weight of an iPad (used with an iPad 4 it creates a hefty 977g gadget), which is a tad too much, but otherwise it’s easy enough to travel with. The aluminium cover looks a tad Apple-y, too, though the Logitech logo is bound to raise a few eyebrows among your fellow tableted travellers. Simple to pair with an iPad, we found the keyboard comfortable enough to use, though we weren’t able to fully test-out Logitech’s claim that its battery lasts for six months. Thicker than a normal iPad cover it might be, but its only 8mm in depth and at a mere 320g it doesn’t make much difference. However, since it uses Bluetooth to connect to an iPad, it can’t be used as a keyboard while in an aircraft cabin. A wired option would have useful, but we’re happy enough to take it along as a prop-up stand – and as a classy cover.